The general and oft-repeated haunting story claims the church has a picture of Jesus that cries blood (right) and there’s a man who haunts the fields who was allegedly killed by his own tractor. I live not far from the church and I’ve been there many times. A friend and I went about 2 years ago and the visit was alit different! The church was locked but from the inside! There’s another graveyard behind the church in the woods. Graves aren’t marked with headstones but the ground has caved in and you can tell there’s caskets there! Did you notice most of the tombs are babys? I had a wires feeling and wanted to leave and yes I heard the tractor but didn’t think much of it because they had been clearing off alit of the land at the time but I read this and start towonder, but anyways. I have a video you may want to see… as I walked away I felt someone watching me so I held my phone over my head and walked to the car. Once I got to the car I turned around in time to see someone close the curtain at the top of thechurch. (Where the slaves sat) we have never showed it to anyone because we were scared people wouldn’t believe us bit its real! Someone haunts that church! Share the video .my great grands are buried there..this is the first one where blacks and whites are buried together in tylertown. 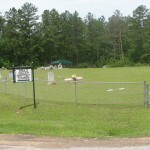 I grew up going to that cemetary almost every weekend. Actually my father maintained the grass for years. 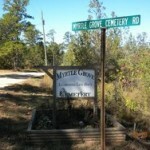 My grandfather and aunt (she was an infant at the time) is buried there. I always thought I seen someone at the top half looking out the window and children playing. I remember falling while my brothers and I were playing one while my dad and other were doing the grass. I cut my stomuch at first we thought nit was a rock but when my brother picked it up it was actually a skull. On more than one occasion, years ago, we went inside the church at night. We would look all over it and play the piano and go back out, close the big sliding door and either visit the graveyard or go to the car to leave. Well, the big door would be open when we got ready to leave, the first time I thought I forgot to shut it, but after the 2nd, 3rd, and 4th time, and speaking to others that it scared so bad that they never back when it happened to them, I know for a fact that it wasn’t an accident. Hi my name is cindy collins . My dad was born in kokomo. All of my relatives are from the Darbun mississippi, jaceeys mississippi..all within that area dated back to the 1600’s. I visited this church as a child, I am now 63..the road was a narrow very hilly gravel road, with a small gravel entrance to the church surrounding it by woods..two separate graveyards, one for the white families and then the slave cemetary. Over the years they widened the road turning it to cement and flattening the hills which really makes me sad as it takes away from the true history of the church and the way it truly looked back then. Anyway I was about 9 years old on one of our visits with my dad when I wandered into the church quite curious and so amazed. I had such a strong feeling for a young child. No fear just a strong unexplainable feeling, I remember as I stood there so taken in I looked up to the balcony and suddenly I saw black slaves, women with rags wrapped round their heads, men, and children and they were singing hymns, I was so excited over what I saw and heard I ran out to tell my dad when he looked at me and said, cindy quit making up stories and I said, I promise I saw them and heard them.. he said, ok that’s enough.. I was so disappointed he didn’t believe me. To this day I remember the incident so well..and remember a womans face in particular as she looked right at me. Vivid imagination some may say, as for myself, I believe in what I heard and saw that day at the Pine Grove Baptist Curch!